It’s not enough to affirm yourself to inner peace. You have to experience it in the physiology. The deep restfulness experienced during PARAM PRANYOG relaxes the body and allows it to release stress and built-up fatigue. When your nervous system is less tense, you can react more calmly to problems that arise. Studies have found that the PARAM PRANYOG reduces anxiety, depression, and even symptoms of post-traumatic stress disorder. The peacefulness of PARAM PRANYOG can be measured. Research suggests that breathing slows down, the heart rate decreases and cortisol (a major stress hormone) is reduced. Unlike other meditations, the PARAM PRANYOG produces significant coherence in brain waves, particularly in the alpha range which is associated with relaxation and the promotion of total brain functioning. The peacefulness of PARAM PRANYOG can be measured. Research suggests that breathing slows down, the heart rate decreases and cortisol (a major stress hormone) is reduced. Unlike other meditations, the PARAM PRANYOG produces significant coherence in brain waves, particularly in the alpha range which is associated with relaxation and the promotion of total brain functioning. True inner peace is the sense of calm and centeredness needed to be effective in today’s busy world. In sports, they call it “the zone,” where athletes perform at their peak while maintaining a calm, comprehensive point of view. You don’t need to retreat to a mountaintop to find inner peace. Just practice PARAM PRANYOG twice a day. 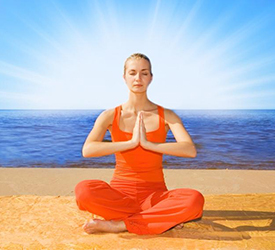 By adding the calming experience of the Param Pranyog to your daily routine, inner peace grows. It’s similar to dying fabric the old-fashioned way—alternately dipping it in dye and fading it in the sun until it becomes color fast. In that same way, the alternation of PARAM PRANYOG and activity quickly produces a state where you are never overshadowed by stressful experiences. No matter what problems arise, you face them with a strong steady state of mind.